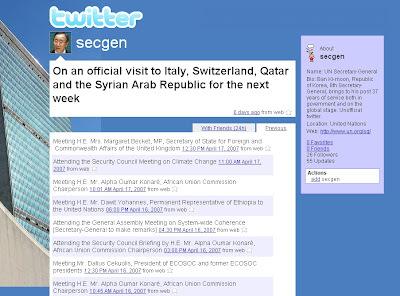 I have the impression that Twitter account twitter.com/secgen is being used by Mr Ban Ki-Moon, Secretary General of the United Nations, or by one of his assistants. You have to be careful, because several Twitter accounts have been detected as fakers (see the Fakers page on the Twitter Fan Wiki). Someone who registers an internet domain can be traced by using whois to reveal his identity. It is currently not possible to trace the person who is using a Twitter account. The only thing you need to claim a Twitter account is an email address. Several Twitter accounts have already been created with company names, but there are currently no messages or just one message on these accounts e.g. Luckely for those companies, the Twitter accounts are not yet abused for negative publicity for the products and offerings of the companies. (Disclaimer : I did not claim these Twitter accounts). 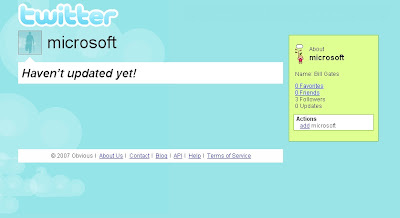 Currently it is not (yet) possible to transfer or trade Twitter names. Perhaps some cyber/Twitter squatters are hoping that this will be allowed in a short time. The guys running Twitter Inc. should come forward with a set of rules to regulate the Twitter community, an addendum to the Terms of Service. Who has the right to a Twitter name, the person who claimed it first ? Or the company who registered the trademark ? Which country will have the priority, as trademarks in different countries for a given name are not always owned by the same company. Will Twitter Inc. make it possible to transfer Twitter accounts from one person/company to another ? As Twitter is at least at this moment commercially not very interesting for companies (e.g. there are no ads) there is no urgent need to solve these kind of questions. If Twitter becomes a huge success, people at Twitter Inc. will have to start thinking about these issues. Companies such as Coca Cola, Dell, IBM, McDonalds, Microsoft, Nike, Pepsi or Toyota care a lot about their image in the real and cyber worlds. Have these companies already discovered the bright new world of Twitter ? Future will tell.